How big was Biafra? The 1966 the population of Biafra was equal to the total number of people living in the West African states of Togo, Dahomey (Benin), Ghana, Liberia, Sierra Leone and The Gambia put together. 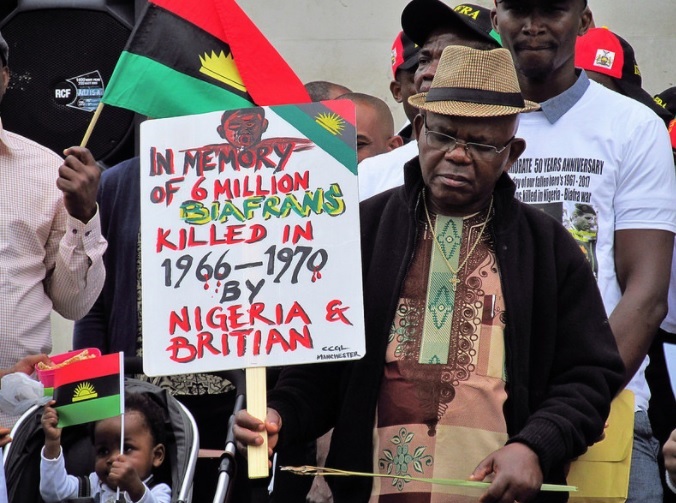 In the whole of Africa, Biafra is now the fourth largest in population, exceeded only by Nigeria, the United Arab Republic and Ethiopia, and equaling Congo Kinshasa (Democratic Republic of the Congo). Biafra population density was about 500 persons per square mile. The total area is over 29,400 square miles. Therefore, Biafra was almost as big as The Gambia and Sierra Leone put together, was bigger than Togo or Rwanda and Burundi combined. In 1966, the Fulani Hausas in northern Nigeria began killing the Igbos or Ibo, Ibibio-Efik, Ogoja, and Ijo provoking thousands of to flee for their lives to eastern Nigeria, where the Igbos were in the majority. During the massacre of May 29, 1966, which was the reaction of the Fulani-Hausa to Unification Decree No. 34 (the Decree that started the ending of Regionalism) of the Supreme Military Council, Biafrans were the sole victims and there was no discrimination with regard to their individual ethnic origin. The massacre of Biafran army officers and men on July 29, 1966, and of Biafran civilians later, followed the same pattern: they were killed only because they were Biafrans. Those who survived the organized massacre led by Fulani Hausas fled back to their homeland. The Igbos fearing for their lives which 30,000 were killed under the Nigerian government, on May 30, 1967, Lieutenant Colonel Odumegwu Ojukwu and along with others established the Republic of Biafra, comprising several states of Nigeria. With a population of over 14 million living in a small area of land, they finally had an undisputed homeland of their own. After diplomatic efforts by Nigeria failed to reunite the country, war between Nigeria and Biafra broke out in July 1967. Biafran war also known as the Nigerian civil war was one of Africa's bloodiest post-independence conflicts. The Biafra Igbo proverb is used when one is being warned against misplacing his or her trust or taking things for granted. 'O wu ndi nke anyi, o wu ndi nke anyi' ka ndi awusa jiri gwu madu n'Afo Umuohiagu." 'It is our own, it is our own' that helped the Hausas to kill us in Afo Umuohiagu market. The proverb alludes to the 1969 war air raid on Afo Umuohiagu market during the Biafran war in which hundreds of Igbo buyers and sellers were killed. A bomber jet zoomed past the first time without releasing any bombs, the Igbo market buyers and sellers who ran for cover at the sound of the plane returned to the market shouting "Oh it is our plane, Biafran plane!”. Only to be taken by surprise a few moments later when the bombs were released and almost everyone at the packed market place was slaughtered. On January 11, 1970, Nigerian forces captured the provincial capital of Owerri, one of the last Biafran strongholds, and Ojukwu was forced to flee to the Ivory Coast. Four days later, Biafra surrendered to Nigeria. Biafra officially the Republic of Biafra was a sanctuary secessionist state in West Africa that existed from May 30, 1967 to January 1970.